Many moons ago I did a presentation on the futures of user interfaces where I talk about why true immersive 3D environments (not like LookingGlass but true 3D) were unlikely to be useful for standard corporate users and why voice as a command mechanism is a bad idea. I had a slide back then with a cartoon on it, that unfortunately I cannot now find. Yup the person runs down the corridor formatting all the hard drives that they can. Now back then I worked in a unix shop so the command was "rm -rf /" but I think format c: works just as well. My point was that voice commands are quite inefficient for lots of users and are also subject to office noise interference, the example was just a silly way to show what I meant when I talked about people wandering up to your desk and asking "did I send the email to you?" and the computer sending the email you hadn't finished. 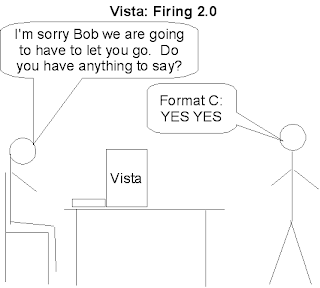 Now it seems that Windows Vista might have made the silly a reality. Welcome to Firing 2.0, like Firing 1.0 but with sound effects.